Congressional candidate Frank Spotorno calls on Queens cafe named ISIS Hookah Lounge to change its name after terrorists attacks in San Bernardino and Orlando. In memory of those lost in Orlando and San Bernardino, I am asking the owners to change the name of their cafe. 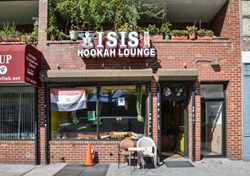 Frank Spotorno, Republican candidate for Congress in the 14th District, NY, renewed his call to work with the owners of a cafe named ISIS Hookah Lounge, located in Astoria, Queens at 23-52 Steinway Street, to change the name of their establishment. Last year, after the killing of 14 Americans in San Bernardino, CA, Sportorno asked that the ISIS Hookah Lounge change their name. The owners explained that there were significant costs involved in changing their business' name, including purchasing a new sign and obtaining New York City permits. Several New York City newspapers have covered the story since the hookah lounge opened in 2010, which was named after the Egyptian goddess Isis. The owner of the cafe, Michil Gadalla, a Coptic Christian, said in a statement to the Daily News that the ISIS of today are “terrorists” and “terrible people – they give a bad reputation to my business." Gadalla has also explained that he wants to change the name, but he claims it’s too expensive, estimating the costs at more than $15,000. ISIS pharmaceuticals, a $7 billion California biotech company that makes drugs to treat cancer and neurological conditions, changed its name last year to Ionis Pharmaceuticals. The company used the name ISIS for 25 years before making the change. “We decided to change our company name because, when people see or hear our name, we want them to think about the life-saving medicines we are developing,” said Ionis COO Lynne Parshall. A nail salon in Queens named ISIS Nails changed its name in 2014 after its business dropped by 30 percent and harassing calls and visits were made. The name of the establishment is now Bess Nails and Spa. Other companies, including Isis Wallet and ISIS Downtown, have changed their names. Spotorno believes that it’s time for ISIS Hookah Lounge to do the same. “If Mr. Gadalla really wants to change his business' name, perhaps there is a way for all Americans to help him. I will help to try to raise the funds, and make a personal contribution, to make it happen," said Spotorno. For more information, visit spotornoforcongress.com. Please send media inquiries to Dan Murphy at spotornoforcongress(at)gmail(dot)com (email) and 914-714-4370 (phone).